In the first week of March 1829, my great great grandparents finally rode into Arequipa, Peru. Charles and Eliza Crawley, with their year-old son Charlie and his nurse, had sailed out of Liverpool on September 3, 1828, more than six months earlier. Charles was a junior partner in the South America branch of a large British trading house, and the family was bound for Lima where he would oversee the firm’s operations for the next four years. It had been a difficult voyage. Eliza wrote of frequent seasickness and long days spent lashed to their bunks. But finally on December 6, they safely rounded Cape Horn and began to hopscotch their way up the Chilean coast, calling at their offices in Santiago, Tacna and now Arequipa. The streets of the long-hidden world inside the walls of Santa Catalina Monastery. Now, 189 years after my ancestors’ intrepid journey, I have come to see for myself. I, too, feast my eyes on the landscape – excited by my first sighting of the dormant volcano El Misti and the massive multi-peaked Chachani. But what a difference a couple of centuries makes! I am on the final leg of a pampered two-week Peruvian adventure with Monograms, having just spent two days at Colca Canyon’s luxurious Colca Lodge, photographing the majestic condors and soaking away the nagging effects of altitude in the Lodge’s three natural hot pools. Peru has been spectacular, but now Arequipa will be my last stop. Founded by the Spanish in 1540, Arequipa is Peru’s second largest city, its historic centre now a UNESCO World Heritage Site. It is known as the “white city” and it’s easy to see why. Constructed of creamy white volcanic “sillar”, the soft stone was irresistibly easy to shape – and elaborate carved white stone facades are everywhere, having stubbornly survived despite centuries of devastating earthquakes. There is much to see in this historic city. My friendly and knowledgeable Monograms guide, Hildana arrives early to whisk me off to admire the looming volcanoes from the city’s best viewing points. Then we continue on foot to explore the colonial heart of the city. First up is Plaza de Armas, the city’s main square, followed by the magnificent Jesuit Church, the Iglesia de la Compañía, with its impressive carved facade, ornate gilded interior, and its painting of the Last Supper – famously featuring cuy (guinea pig) as the main course. Entrance to the Orange Tree cloister. 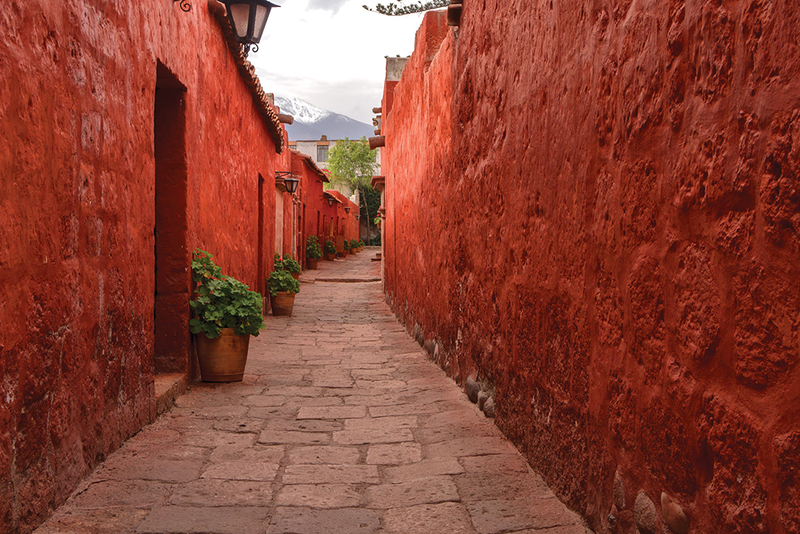 Arequipa is a city of courtyards. As we walk the narrow streets around the main square, the high stone walls are punctuated by massive wooden doors. Protectively closed at night, these man-on-horseback-sized doors stand open during the day. “See where the door knocker is?” she laughs, pointing several feet above my head, as she leads me into the elegant courtyard of Casa Tristán del Pozo. Now owned by a bank and open to the public, this colonial gem was once a lavish family home. Much of the old city’s leisure and commerce takes place in these interior open air spaces. Through those doors and up the stairs – as Hildana points to Chaqchau – is the best hot chocolate in town. We peek into the next courtyard with its popular creperie. Intimate cafés, galleries, antique shops are all tucked away inside these courtyards, crying out to be explored. Finally, we come to Arequipa’s greatest cultural treasure. 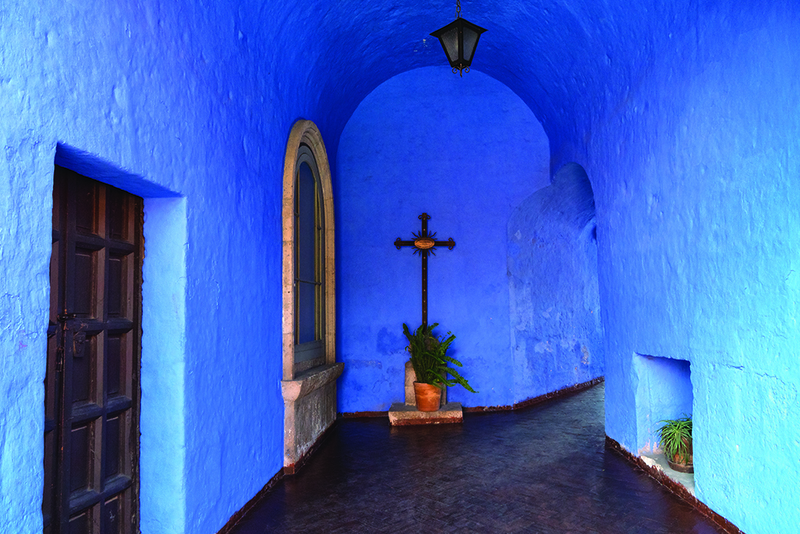 Hidden away inside massive stone walls is the spectacular Santa Catalina Monastery. As we pass under the Silencio Arch we are immediately transported to another world – and another century. This five-acre city-within-a-city is a maze of narrow cobbled streets named after Spanish cities, tiny stone houses and cloistered courtyards. But the sundrenched colour is the real star here. Stone walls dazzle in vibrant natural pigments – rich reds and umbers, orangey ochres, and splashes of indigo blue – a photographer’s fantasy. When the monastery was founded in 1580, it was traditional for families to promise their second son or daughter to the church. Santa Catalina offered a privileged life of contemplation and prayer, and wealthy families lined up to pay the hefty dowries to secure a prestigious position as a novice for their young daughters. Though the nuns were isolated from the outside world, they lived in considerable comfort. Senior nuns had their own houses and brought with them their rich furnishings and art, and even their servants. 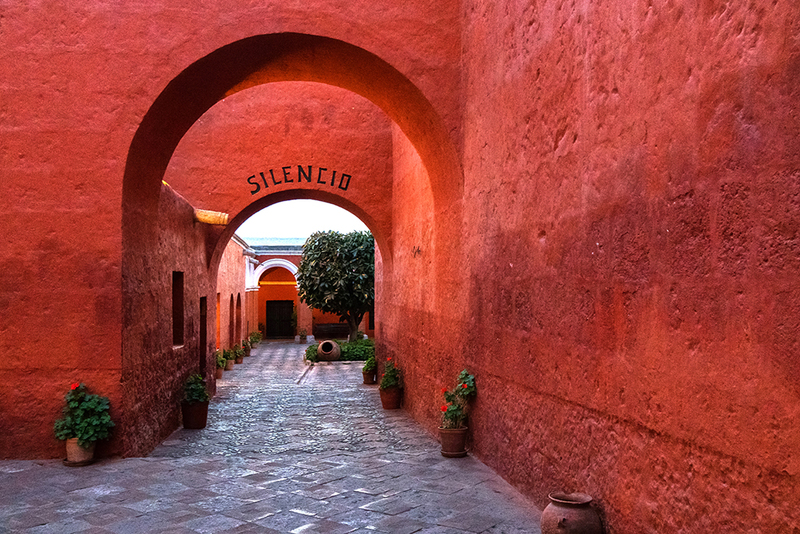 The Silencio Arch, in Arequipa’s Santa Catalina Monastery. The good times ended in 1871 when the wealth was confiscated by the Church, and a strict new austerity was imposed. Santa Catalina remained frozen in time until the 1970s when the doors were opened to help fund earthquake repairs and a modest modernization. The monastery is still home to a handful of nuns, who live quietly in a private area within the walls. It is well worth arranging your visit for one of the days when the monastery is open in the evening. Lighted by candles and lanterns (and dim streetlights posing as gas lamps) it becomes almost mystical by night. Wood fires smoulder away in the nuns’ kitchens and rooms are illuminated by a single flickering candle. In the quiet darkness, you can almost see the nuns moving silently along the shadowy cobbled streets of their hidden world, just as they would have done for centuries. IF YOU GO Monograms offers a wide selection of independent travel packages throughout South America and around the world, ranging from short city stays to comprehensive multi-country tours. All packages include a choice of hotels, transfers between destinations, local sightseeing and the services of their excellent Local Hosts. Call your travel advisor or visit www.monogramstravel.ca. The spectacular carved white sillar facade of Iglesia de la Compañía. All photos by Linda Crawley.